somthing unexpectable has happened. i’ve been spreading the information of voodoo being closed down due to loss of interest. this of course is mostly my own fault, it’s me who had no time nor interest for this project but one of the reasons for the quiet phase sadly is that after a departure of various artists there simply was no much activity. we lost great guys like tweeter, dharma and linus just to name few. a new page has been turned and after losing a bunch of people we have got fresh blood to the group, this new guy is of course a/oc, a friend of loke whose debut we are releasing today. this also represents the rise of voodoo because i didget some kicks for the activity after a/oc joined. also, new members can be recruited so if you think you handle the style so precious to this group you are welcomed to e-mail me with one example of your music. but to ease this project i’d hope you to have some experience on the previous tracks released to avoid from being disqualified. voodoo is strict of it’s style. e-mails must be directed to kuu@ion.sci.fi with subject ‘voodoo apply’. so i am finding out if it’s still worth to go on with voodoo and now it is all up to you. but rising our head still doesn’t mean a new release every week. either there will not be a homepage which has been asked many times. no mailing list for the productions. only way to get your releases is the old fashioned swapmail or aminet ftp. 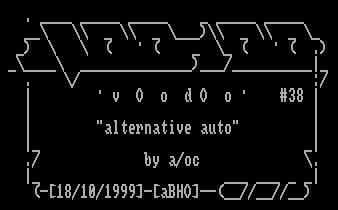 allthough if you have an ftp server and enough room and interest to build up an voodoo section, mail me also. 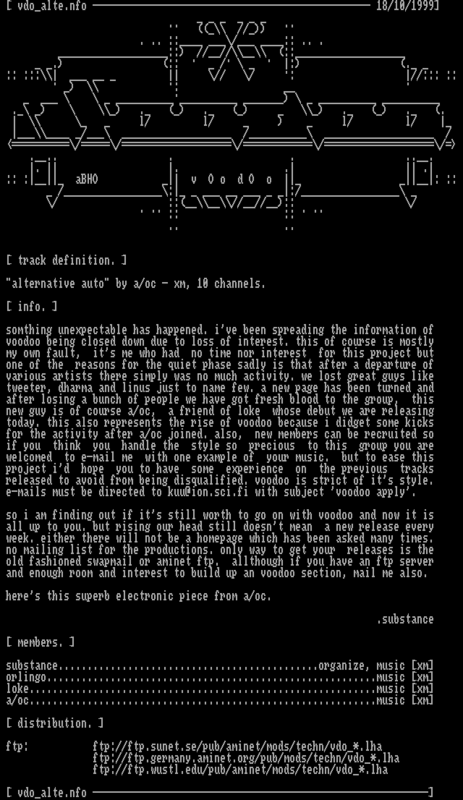 here’s this superb electronic piece from a/oc.